We bring you another unique weapon ‘Kiloton Radium Rifle’ that you will find in the new Fallout 4 Far Harbor DLC. Kiloton Radium is a semi automatic rifle that also shoots explosive and radioactive bullets. This unique weapon Kiloton Radium Rifle can also be bought from the factions in the game as soon as you get access to their services. 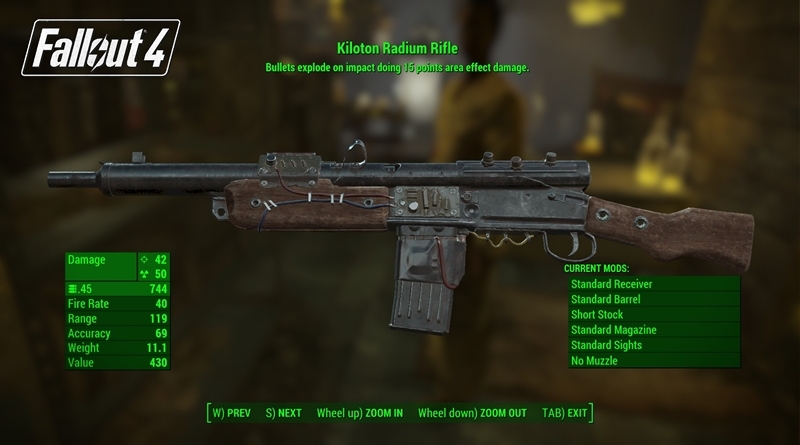 In Fallout 4 Far Harbor Kiloton Radium Rifle guide we will help you find this unique Kiloton Radium Rifle in Fallout 4 Far Harbor. This weapon can be bought from Kane, a vendor at Children of Atom headquarters. For this you do not need to progress the quest line, you just need access to their base. Once you are inside Nucleus look for the staircase at the far end of the submarine bay. After climbing the stairs you will see the Kane’s shop at the opposite side of the submarine. Kiloton Radium Rifle is a mid range rifle with good accuracy and damage. But the fire rate and magazine capacity are really good in this weapon. Along with the usual radiation and ballistic damage, the bullets also explode on impact making this weapon more lethal that damages enemies in a certain way.